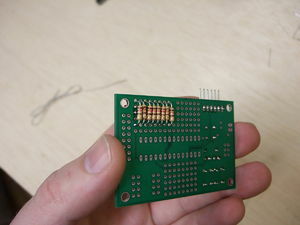 Before you start assembling anything, have a look at the printed circuit board. Big and bold in the center is the location for the AVR chip. Notice the notch in the silkscreen at one end? That corresponds to a notch on the top of the AVR chip, and helps you get it in the right orientation when the time comes. Just to the outside of the AVR chip itself, you'll see two rows of holes labelled for the port/pin combinations that appear in the datasheet. For instance, just below the chip see the two rows labelled PORTD, and PD0 -- PD7. See how there are tiny white lines connecting the two rows of holes, pairwise? Those indicate that the two holes are electrically connected to each other. 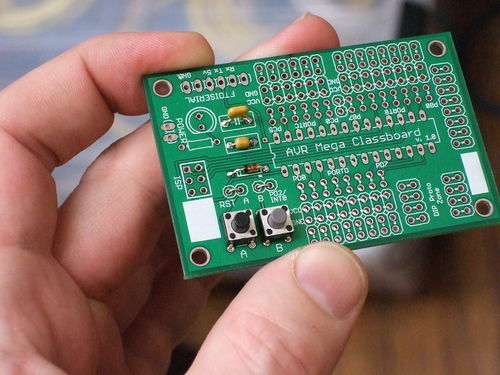 This was a convenience -- you can solder two things easily to each AVR pin. One side of the chip has PD0-PD7, the other has PB0-PB7 and PC0-PC6. Just outside of the AVR connection points, you'll see two more rows of holes, labelled VCC and GND respectively. 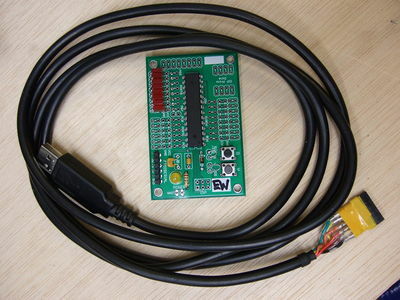 GND is connected to the board's ground plane, and so is at 0V. 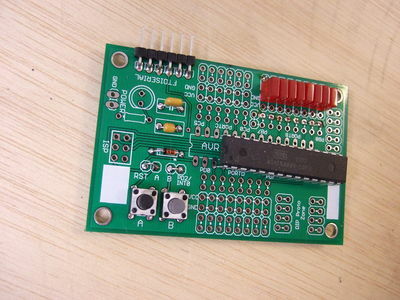 VCC is connected to the board's power supply and is whatever voltage you're using to drive the whole mess -- In class, I'll refer to this as VCC or I usually just call this 5V. And finally, at the edge of the board is another pair of rows of holes. These are electrically connected in pairs, and are just there to allow you to connect things together easily. 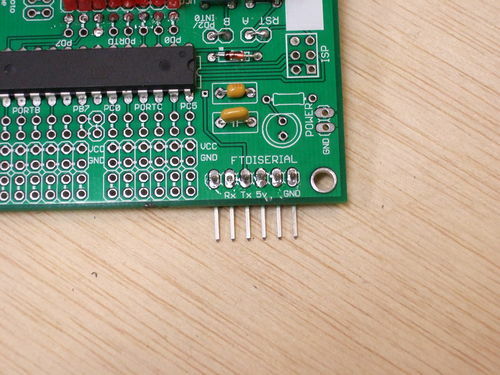 For the LED array, we'll use these paired holes to connect the resistor to the positive end of the LED. To the left of the AVR, there are holes for two buttons, a protection diode, power-supply buffering capacitors, an optional power LED and its resistor, a 3x2 SPI programming header, and the 6-pin inline FTDI cable. Below the AVR chip area and to the right, there's more prototyping space -- just sets of holes electrically connected to each other in ways to facilitate soldering stuff up. The power LED and it's associated LED are optional and included for your creative use/abuse. Everyone should solder the coolest LED they can find in here, with a 100-1k ohm resistor, depending on how bright you want it. And those white areas? They're for writing your initials on. Or notes. Tiny, little notes. 0) If you're new at soldering (or even if you're not) go spend seven minutes with the best soldering video ever. 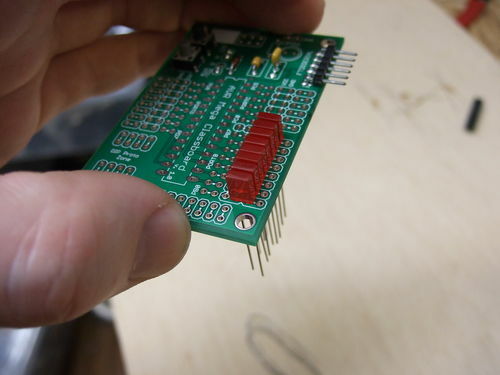 1) To get your feet wet soldering, install the two capacitors. They can go in either capacitor position, and are non-polarized (can go in either way). When you clip off the leads from the capacitors, save the wire for the next step. 2) Now install the two pushbuttons. They're oblong, but there's no top or bottom. 3) Solder in the protection diode. Notice that it's polarized, with a black band on the diode itself corresponding to the little band in the silkscreen. 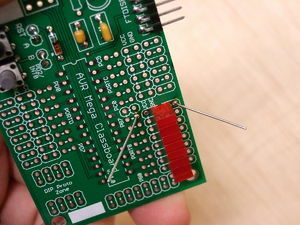 4) Above the buttons, there are two pairs of holes -- these connect the button to the pin on the AVR when they're jumpered together. (I did this for flexibility so that you could connect the buttons up to other pins later as you wish.) Take two of the leads you saved in step 1) and connect each pair of holes together. 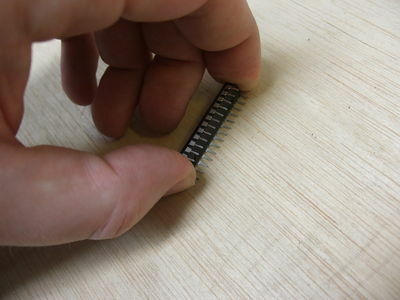 5) Solder in the 6-pin header for the FTDI cable. Rather than doing it the way I did (which covers the labels on the circuit board) why not mount the header on the bottom side like Ed did? 6) Now start on the LEDs -- in PORTB pins PB0 through PB7. They _are_ polarized, and you'll notice that one lead is longer than the other. The short lead gets connected to ground, while the long lead will eventually connect through a resistor to the AVR output pins. (Resistors soldered in next step.) 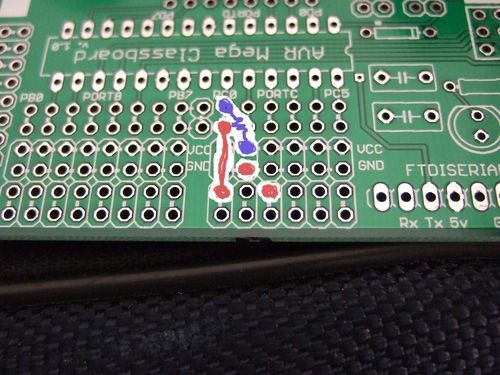 Place the LEDs so that their short leads are in the ground strip (labelled GND), and the long lead is in one of the outside rows of hookup holes. Orientation matters here. 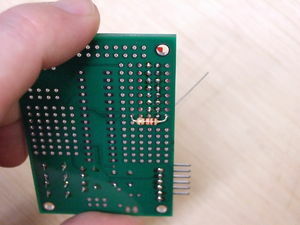 Double-check it before soldering? For aligning the LEDs, I had success putting them all face-down on the table, and using the fact that they have rectangular faces. Pro-tip: solder one pin on each LED, make sure they're in a nice line, and re-heat any that you need to wiggle into place. Then solder in the second pin on each LED. 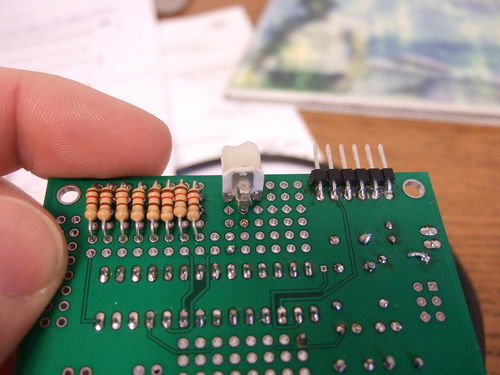 7) Once you've done the LEDs, you can solder in their resistors. These fit most easily and cleanly on the underside of the board, so you'll want to trim off the extra leads from the LEDs before installing. 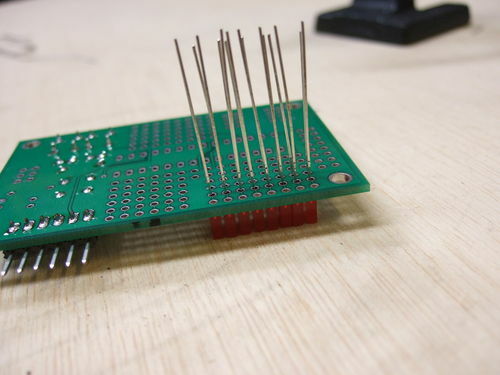 You want to solder each resistor to the outside strip of holes that connected to the positive (long) pin of the LEDs, and the other end of the resistor to the pins of the AVR. Notice that you're working on the back-side of the board! Double-check that you're not connecting the resistor to the VCC line that is closest to the LED. 8) At this point, you can install the chip. They come from the factory with the pins splayed out a little bit -- you can lean the chip into a tabletop to straighten the pins out. Place the chip with the notch on the top of the chip corresponding to the notch in the silkscreen. Double-check. Solder. 9) Optional fun stuff: Feel free to solder in an artistic power LED and its resistor. (Note the polarization. Short pin downwards, or notice that there's a flat-spot on the LED flange.) Write your name on it. Wire up the battery (black wire to GND). 10) You should now be ready to flash in your first program. Hooray. From here on it's (mostly) firmware! 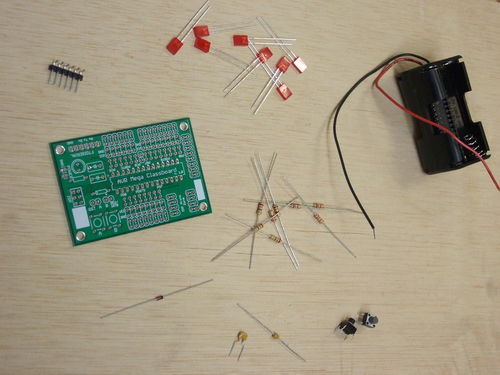 For the light sensor, you're creating a voltage divider with the photoresistor and two legs of the potentiometer used as a variable resistor. The photoresistor is connected to VCC and the AVR pin PC0, and the variable resistor from PC0 to ground. In the following image, the red pins represent the potentiometer, and the blue are the leads from the photoresistor. 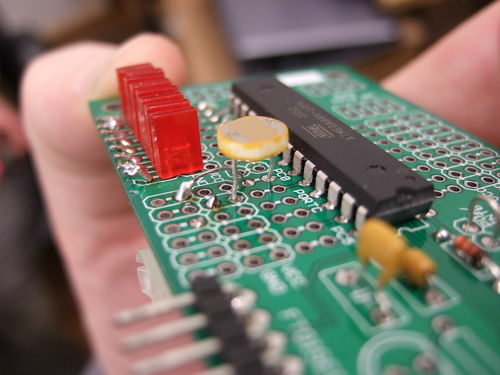 Start out by placing and soldering the potentiometer on the underside of the board. Make sure that the smaller center pin connects to the ground lines. Do _NOT_ clip the leads short yet. Bend one lead on the variable resistor up and over the two other holes on the board, and plug it into PC0. Solder it in on the top side. Now soldering the photoresistor in place should be easy. 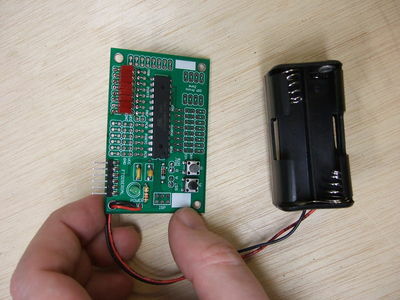 Flash in the light sensor firmware and turn the potentiometer until it give you a nice range of values on the LED display. I found that turning it up to _just_ max out in full light works well -- you'll see that it'll get down to one or two bars when you cover the cell with your hand. You're done! If you'd like to make yourself a class-board, the attached Eagle files should get you started. Warning: It's a good idea to socket your AVR in the board so that you can remove/swap chips when you want to. Also, the LEDs in port B will over-ride the SPI port. For the class, we used AVRs with a bootloader already flashed into them, so we didn't use the SPI most of the time. If you'd like to use the SPI instead, you can probably get away with using large-value (1k Ohm?) resistors for the LEDs. Best is to omit them if you're going to use the SPI a lot, though. Finally, if you want something with almost all of the functionality (but none of the style! 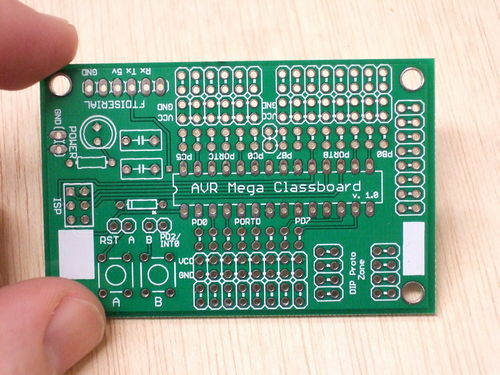 ), Evil Mad Science sells a nice, very cheap, AVR Mega breakout board. This page was last modified on 19 February 2014, at 14:51.